Arthur Madore, LMT, a licensed massage therapist at the Osher Center for Integrative Medicine at Brigham and Women’s Hospital (BWH). I am often asked for advice on the best sitting posture. The problem is that there is no one position that will be comfortable for everyone over a prolonged period of sitting. But there are some steps you can take to avoid strain and pain. However, sitting up straight comes with some challenges, too. Try sitting up tall. Did you start by tightening your lower back and pulling your head up? Would you be able to stay in this position very long? Now, appreciate how difficult it is to look over your shoulder or up to the ceiling. When the muscles that perform these movements are busy holding you erect, they are more strained when adding another action. A better way to sit erect is to roll your lower body under your head and torso rather than pulling your upper body over your pelvis. Your spine is supported upright because it is connected to a pelvis that is tipped forward. An alternative position is to sit with your knees wide, on the edge of your chair, and simply roll your pelvis back and forth like you are riding a slow, gentle horse. Eventually you will notice that you are sitting upright with less effort. When done correctly, you will notice that is easier to breathe and there is less strain in the lower back, neck, and shoulders. You also will be able to move more freely. 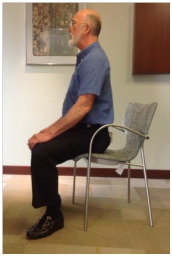 Another strategy to avoid poor posture is to make sitting a dynamic activity. This can be accomplished in several ways. Set an online timer for about 20 minutes as a reminder to get up and stretch for a minute. You also can set it to remind yourself to simply assess how comfortable you really are. Sit on an air-filled balance disc. The tipsy surface makes it difficult to sit still. Some people find that sitting on a large therapy ball also works well. It simply makes you want to move. Strategically place your water, phone, pens, etc., on your desk so you have to move frequently to reach them. Use recurring events, like phone calls or checking emails, as reminders to take a relaxing breath. Remember, the posture position that works for you may be different than what works for others. And be patient! Poor posture habits, ingrained over many years, take time to change. Learn more at the Brigham and Women’s Hospital Osher Clinical Center.